1. 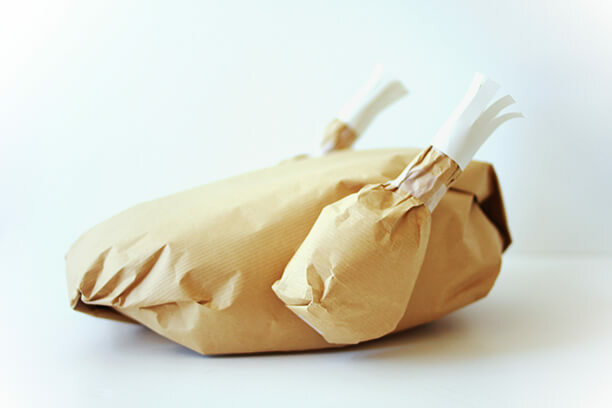 Wad up your craft paper (or brown paper bags would work too) and mold it into the shape of two drumsticks. Use the tape to secure the paper into that shape. 2. Wad up and mold the craft paper into a shallow oval bowl. Keep adding more wadded paper (while securing with tape) to build up your sides of the bowl and make one end almost twice as high as the other. This helps give your turkey a more realistic slanted shape. 3. Fill your empty turkey cavity with your “stuffing” (but make sure on yours to lay the items down so that none of the goodies stick up higher than your turkey walls). 4. 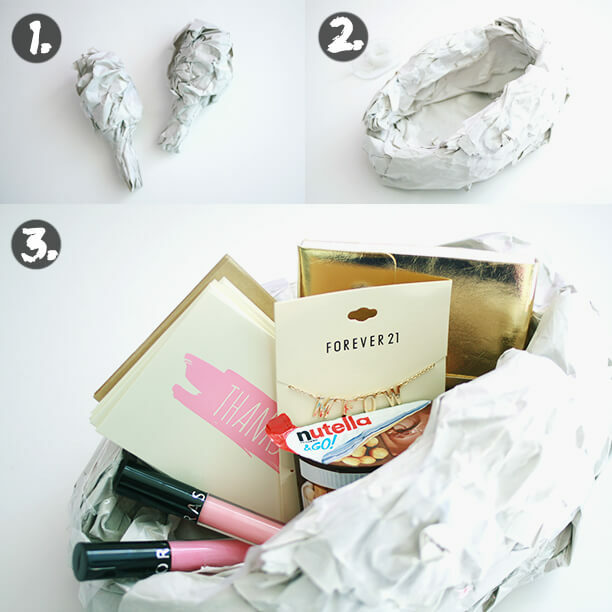 Carefully flip your stuffed turkey over onto a sheet of brown craft paper and fold up the sides of the paper until they meet in the middle (like you would if you were wrapping a present) and tape in place. 5. For the ends, it’s pretty much the same as present wrapping, but instead of folding in each side towards the middle only once, I did two folds in order to get closer to the turkey’s body and then folded up and taped flap in place. 6. Flip turkey over. See? Now the stuffing is hidden within the turkey’s body! 7. 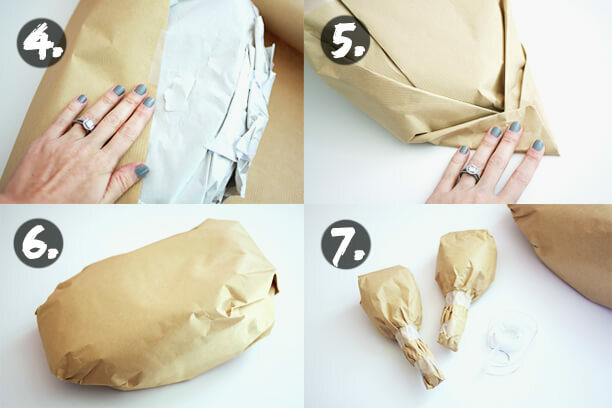 Wrap the drumsticks in craft paper as well and use white paper to make little fringed turkey frills. Attach your legs to your turkey with glue, and you’re done! How cute is that?! 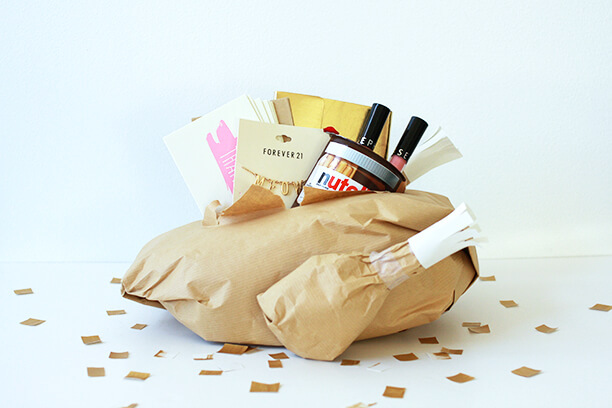 Now that your turkey is properly “stuffed”, you can pack it in a box and ship it off for a delightful holiday surprise. Of course, my turkey is packed with some of my most favorite things, but you can customize yours as you wish. My mom said my turkey should be arriving early this year, so I’ve been on the lookout for it every day. Oh the joys a paper turkey can bring! Categories: HCYMT? | November 11, 2013 by thebandwifeblog. 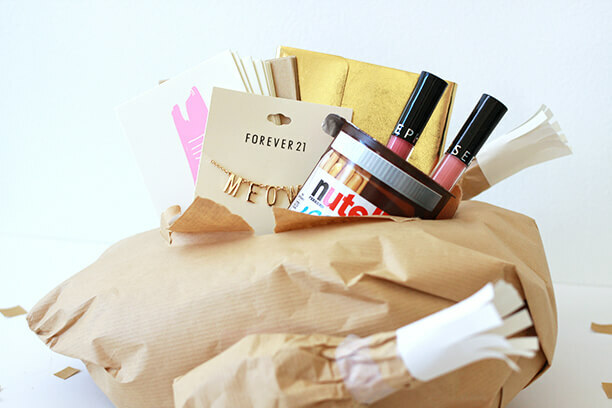 This is the cutest DIY! Very original and sweet to send to a far away family member during the holdiays. Nicely done, Laura! Not sure how I never realized you were originally from my neck of the woods! Pennsylvanians unite! This is such a thoughtful gift though, definitely making some of these in the near future. So cute!! But of course, we’re talking about your Mom. She’s great! I’ve been looking for a little something Thanksgivingish to send my husband who is living overseas, this is perfect! Great idea for military spouses too. I’d much rather have this kind of “stuffing” than actual turkey! Love it! Your blog has become my “pick me up” read and the one anticipate most. Thank you!! Aw, thanks so much for reading!! This is such a sweet idea!!! 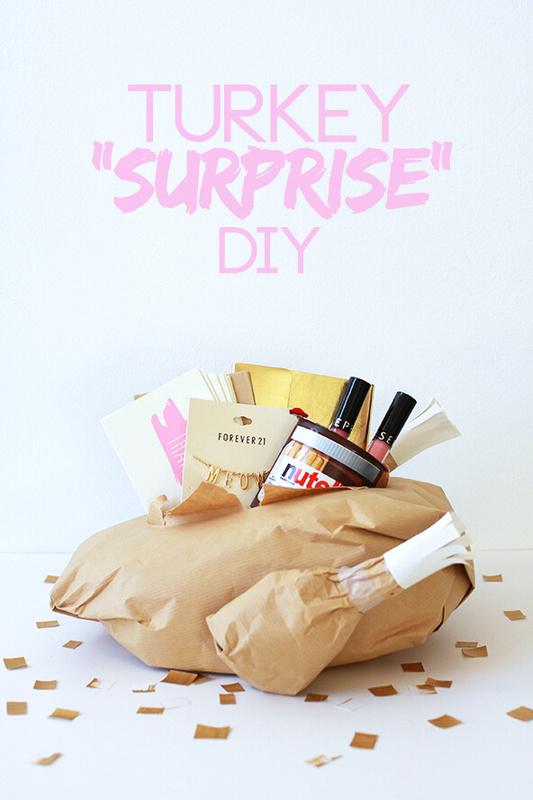 What font did you use for the word ‘surprise’ in the main photo? I’m from a thanksgiving-less nation, so I don’t think it will have quite the same impact but this is so amazing that I am going to hijack it for christmas or something. I like the idea of a family of turkeys nesting under the tree! This is genius. It couldn’t have come at a better time. My fiancee is deployed but he loves the holidays. What a perfect way to help him celebrate!!! I am hosting Thanksgiving but I secretly want to forward this post to my guests. Doesn’t get much cuter. Thanks!